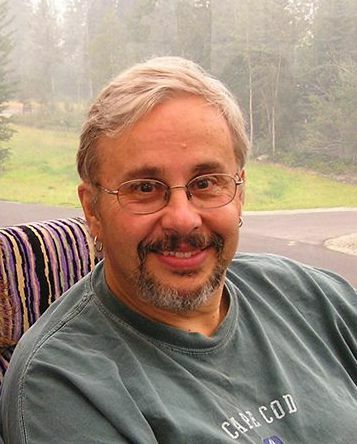 Michael Allen Diamond of Appleton passed peacefully in his sleep shortly after midnight on March 23rd, 2019 at the age of 69. Mike was born August 1st, 1949 to Jim and Lillian Diamond in Menominee, Michigan, the oldest of their 5 children together. Mike attended Marinette Catholic Central High School where he played football and would admittedly say he “was lucky to get out”. After High school, in 1969, Mike married Amy Janusz. Together they had three wonderful boys. The family moved south to New Holstein for work and after a brief few years at Tecumseh, Mike and the family moved to the Appleton area where Mike enjoyed a modest stay at Rich’s bakery. Mike made the decision to return to school attending the journalism program at the UW-Fox Valley extension. It was there that he really found his calling. He wrote for and became the editor of the school newspaper and along the way created a fictional character for a sarcastic and hillbilly version of Dear Abby. Mike earned himself an internship at WHBY / WAPL at the age of 33 where he enjoyed a long career that allowed him a creative outlet and environment where his journalistic talents flourished. He initially only wrote commercials, but then harnessed his audio-editing skills and talent for voices, into voice acting in many commercials. He created several memorable characters along the way and won numerous radio awards. That talent on the microphone landed him a co-hosting position on the Good Neighbor show for many years where his warm voice, friendly demeanor and humorous gift of gab was enjoyed by thousands. Additionally, Mike’s vocal talent, radio connections and love of baseball harmoniously collided with Mike being the public address announcer and official score keeper for the Appleton Foxes for several years in the 80s. Mike “retired” from the radio station after 23 years much to dismay of his many loyal listeners. 14 years ago, Mike found the love of his life in Lindsay (nee Bade). Mike and Lindsay were married in Appleton, summer of 2006. Mike and Lindsay shared over a dozen years of love and cared deeply and profoundly for each other to the end of his days. Mike’s hobbies were varied - he was an avid reader, a lover of music, and a huge fan of all things science fiction. He was also a big geek at heart, and in the freedom of his retirement, he really enjoyed playing a variety of video games, and that’s when he wasn’t playing Del Shannon, John Candy or Lewis Black YouTube clips. And then there was baseball. Mike found many ways to keep baseball in his life – he played a table top game with his sons starting when they were young, championed many neighborhood whiffle ball games, played computer simulated games and also in the last several years enjoyed playing fantasy baseball with his kids. He also greatly enjoyed the Cubs thanks to his grandfather. Watching the Cubs win the World Series in 2016 was a deeply emotional experience. But most of all he really loved being with his family – whenever and where ever he could. Mike had a warm personality and a loving and caring soul and was friendly to everyone he met. Has was a loving husband, a deeply proud father and grandfather, and a fiercely devoted friend. He remained in contact with many from his past (Facebook helped) but he was especially proud of his nearly 60-year friendship with Joe Toniazzo. He will be missed by many. Mike was preceded in death by his father Jim by 28 years, and by his mother Lillian by only two years, as well as his daughter-in-law Nancy (Shawn) by 6 years. Mike is survived by all of his siblings - Jeff (Dolores), Julie, Ken (Heather) and Mark (Chris) and his three sons Shawn (Vickie), Brian (Carrie) and Cory (Penny) and 6 grandchildren Riley, Megan, Delaney (Shawn and Nancy), Rachel (Brian and Carrie) and Tina and Jin (Cory and Penny). A memorial service will be at 1:00 p.m. on Saturday, March 30th, 2019 at the Capital Center at 725 W Capitol Dr, Appleton, WI. At his request, Mike will be committed to ashes. Friends and family are encouraged to come visit, share stories and enjoy light snacks until 5:00pm. The family asks that you come dressed up in your best Cub blue and be prepared for laughs and hugs over stories that celebrate Mike’s one of kind journey.